Friends if you forget your roll number or not have access to your roll number or you want to see the marks of your friends and relative then you can use following method. Go to the following link and see the roll number by name. Go to this link and put the roll number to see the result. 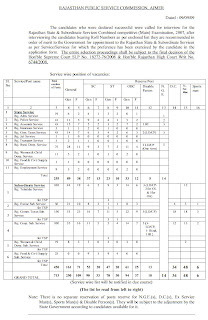 hello naresh brother.is there any news when the result of this year ras mains result is coming.due to the high court`s order it seems that all the vacancies is going to be delayed.is that true. @ Krishana : Congrats for getting 54th Rank. Well I would suggest you to approach DoP as I heard that the allottment is almost over for RAS 2007. What I feel in your case is that 22nd and 25th rank holder's service depend on some facors like whether they have claimed age relaxation or other benefits if yes they will be using OBC seats only otherwise they will take Gen seats. sorry dear can't help out much in this regard, better you take help of someone out there in Department of Personnel to get clearer picture, I hope they can clarify the situation. @ the cut off remain more or less same with a little margin so it seems it remain same as that of RAS 2007 cut off. @ Simi : RAS 2008 result would be out only after the decision of RAS 2007 court verdict which might be completed in july itself. hello everybody..this is first @ras 2010 i am applying for ADmin Services..how to prepare for Pres and mains my subjects are mining engineering +Geology. What is the last rank of selected general male candidate in ras 2007.
i want to know what all posts are awarded to ras exam ranks from 1-50?? Are each year's toppers given top jobs?? If i securea rank of 50 then which post will be alloted to me in ras services? ?